Hurricanes are like drive-by shootings. If you live in a crime-riddled neighborhood, you never know when a stray bullet will pierce one of your walls or come flying through an open window. The more these shootings happen, the more on an edge you are. Well, drive-by shootings aren’t a big problem here in Hawaii where I live, but drive-by hurricanes are. It seems like Pacific hurricanes have been doing their drive-by routines with increasing preponderance in recent years. The last big ones to hit us were Iwa in 1982 and Iniki in 1992. However, there have been a bunch of close calls. One, in fact, is in the works right now. Tropical Storm, which has the potential to turn into Hurricane, is currently on track to pass south of the Hawaiian Islands this Tuesday, says the Honolulu Advertiser News Services. 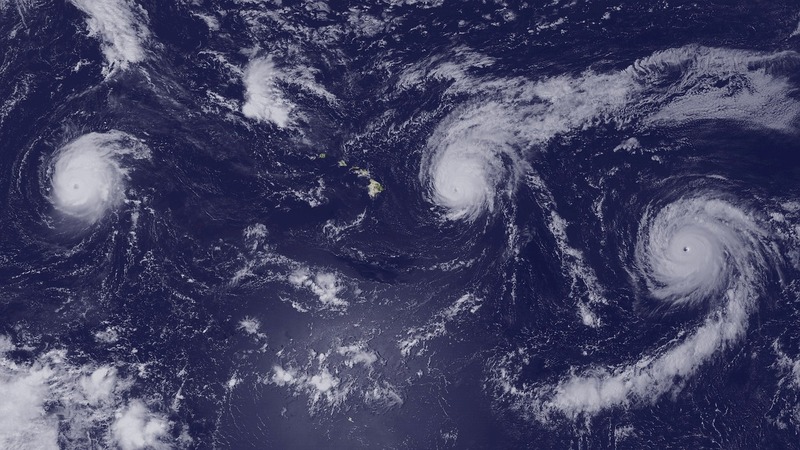 And as Hawaii residents learned from Iniki, hurricanes can and do make erratic unpredictable swings that put our islands directly in their paths. Just like those people in towns with nightly drive-by shootings, we are hunkering down, hoping not to suffer a direct hit. Local leaders and the American Red Cross officials have counseled us to adhere to the Boy Scout motto and be prepared. Among their suggestions are as follows. A gallon of water per person for at least a week, so for a family of four, this means 4×7=28 gallons. A 7-day food supply for each person such as MREs. A week’s worth of medication. Flashlights. Replacement batteries. Battery operated radio. Clothing. Personal hygiene supplies, most notably toilet paper. Sleeping bags. Plates and cutlery. Essential family documents should be carried too. As storms approach, we are urged to protect our homes, many of which are single-wall dwellings made of lumber. One suggested measure is using masking tape on windows to prevent shattered glass from flying amuck. Better yet, we have been told to board up our windows, a costlier yet more effective measure. My neighbor, a master of preparedness, has premeasured and pre-cut wooden covers for each window of his home. When Iniki made its pass-by many years ago, he had his windows boarded up in less than an hour. I should follow his lead. No matter what measures we take to protect our property, if a Cat 5 hurricane were to hit us in Hawaii like Andrew slammed into Florida in 1992, our homes would resemble a scattered deck of cards. We are praying and hoping to be spared once again.